The Plott is the state dog of North Carolina and stems from Hanoverian Hounds brought to North America by the Plott brothers in 1750. Seven generations of Plott men bred the family dogs and used them to hunt bear and boar, and today the dogs are known by the Plott family name. 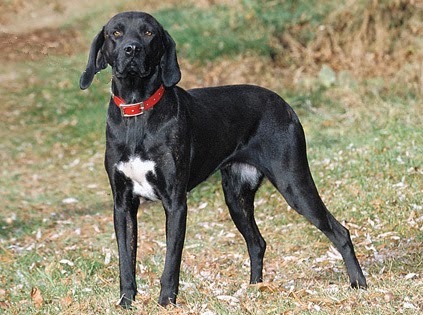 The breed's ancestors, the Hanoverian Hounds, are respected for their ability to locate a wounded animal even though the trail is a week or more old, and some of this tracking ability remains in the Plott. They are also able to quickly traverse rough terrain and water in all seasons. These dogs are athletic and known for their endurance, determination, and courage. They don't require much grooming, but they need daily exercise. In the home they're generally eager to please, loyal, and alert, but they can be quite aggressive and bold when hunting. They often ignore other dogs, and cover attention from humans. We like this guy a lot. Cool-looking dog with an interesting name. Have you met one?